The Life Ring Foundation partners with The Roanoke City Library System for a literacy initiative targeting specific “at-risk” children and school districts. 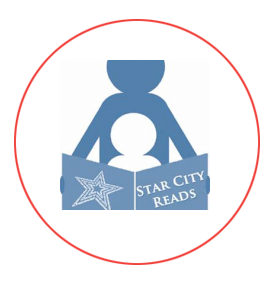 The program is an All-America City Award Campaign to ensure all children in the city of Roanoke are reading at or above grade-level by third grade. Studies have shown that children who do not read proficiently by the third grade are four times more likely to drop out of high school, and students who live in poverty are three times more likely. The initiative provides free, high-quality programs, such as Children’s Author Series, created to bring authors of popular children’s books; and City of Roanoke Board Book, designed to celebrate Roanoke and foster a love of reading. Each infant born in our hospitals receives a copy of Parent Engagement Series, which offers parents the tools to be effective literacy teachers for their children. Fifteen Kindles were given to parents.